If you have been arrested for DUI in Lawrenceville, the first thing you need to do is speak with an experienced Georgia DUI lawyer about your case. Bill Hardman has represented DUI clients throughout the State of Georgia. You may need to send a 30-day letter to request a hearing on the administrative suspension of your driver's license. Please remember that you only have 30 days from the date of your arrest to send your letter requesting a hearing on your administrative license suspension. 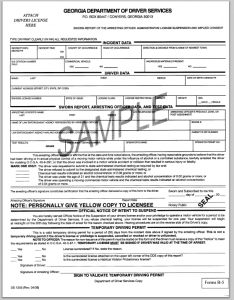 If you receive a yellow/white sheet of paper that is titled "Temporary Driving Permit" at the center and bottom, then you may need to send in a 30-day letter. If you wait until the 45-day temporary driving permit has expired, then it may be too late to save your driver's license. ** You may also be eligible for an Ignition Interlock Device Limited Driving Permit under certain circumstances. You need to speak with an attorney to determine if you are eligible, and if you are, is that what you would like to do instead of requesting a hearing with a 30-day letter. NOTE: If you were given a blood test and did not receive a 1205 Form, you may still need to send in a 30-day letter to request a hearing even though you have not yet received a notice of suspension of your driver's license. A sample 1205 form is attached below. If you request a hearing (send in a 30-day letter), your case case will be heard in the Office of State Administrative Hearings Court (OSAH). The OSAH hearings in a Lawrenceville DUI case usually take place on the second floor of the Gwinnett County Courthouse. The Gwinnett County Courthouse is located at 75 Langley Drive, Lawrenceville, GA 30046. Remember that this hearing is a completely separate case from your criminal DUI prosecution. This OSAH hearing only concerns your rights or "privilege" to drive in the State of Georgia. This applies whether you have a Georgia Driver's License or an out of state license. Your first court appearance in your DUI case will likely be your arraignment hearing. At your arraignment hearing, you have the right to have your charges formally read aloud to you in court so that you know exactly what charges you will face. If you have hired a lawyer, he/she may "waive" arraignment because it may not be necessary to have your charges formally read out loud in the courtroom. When your lawyer files his/her discovery requests (which should likely be done in every DUI case), then your lawyer should receive a copy of the accusation which should include every charge that you are facing. The accusation is the formal charging document setting out the charges against the person arrested. Have a question about your Lawrenceville DUI case? As unnerving as this statement of law may seem, it can be a benefit to a person that has been charged with a crime. If the arresting officer has arrested someone on charges that the prosecutor does not believe that he/she can prove beyond a reasonable doubt, then some of the charges (that the person was arrested for) may not be included in the accusation after the prosecutor has had a chance to review that facts of the case. At your arraignment, you have the right to enter a plea of guilty/not guilty and demand a bench trial or jury trial. If your attorney files pretrial motions including a motion to suppress, then you may have a motion hearing before any trial date. A motion hearing is a chance for your attorney to present all of the facts in your case to the judge and ask the judge to make a ruling on any legal issues that are raised in your motion. Typically, motions include challenges to whether you were legally stopped and arrested. Motions may be appealed but they are typically not appealed until after a final judgment is entered in a case (for example: a finding of guilty or not guilty). When rulings on motions are appealed, they are reviewed on the "clearly erroneous" standard. Unless the reviewing court finds that the trial court ruling was clearly erroneous, then the appellate court will not disturb the trial court ruling. The trial court judge determines credibility and the facts in a motion to suppress hearing. To read a good case regarding a motion to suppress, read Tate v. State, 264 Ga. 53 (1994). This case took place in Cherokee County, GA where it was determined that the officer was stopping certain vehicles on I-75 without a valid reason for the stop. A jury trial is one of the most important founding principals in the United States of America. You have a right to have the State prove any charges against you to the jury beyond a reasonable doubt. Our country understands the importance of the rights of its citizens.The jury is all that stands between a citizen accused of a crime and the powerful State government. The government cannot take away a person's life, liberty, or property until they are proved guilty of a crime beyond a reasonable doubt. Another form of trial is the bench trial. A bench trial is where the judge acts as the judge of the law and as the trier or the facts. The judge makes his determination as to guilt or innocence. If you waive your right to a jury trial, then you may have a bench trial. If you decide that you would like to appeal a possible conviction then you may have a bench trial where you can get all of the facts into the record for the purpose of appeal. Any person has the right to enter a plea before there is a bench or jury trial. In some cases, a person and their lawyer may determine that entering a plea is the best option instead of going to trial. In these situations, it is important for the lawyer to make sure that he/she can negotiate a sentence or punishment that is favorable to the client.